Thomas rests near the Virginia & Truckee Railroad depot in Virginia City before making the journey down the hill to Gold Hill and back. 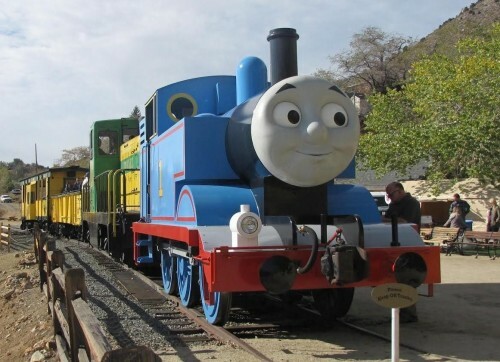 The antique Virginia & Truckee Railroad in Virginia City hosted the famous railway locomotive and television star, Thomas the Tank Engine, loved by millions of children around the world, on the weekends of October 23rd through 25th and October 30th through November 1st. We remember Thomas from way back in the ’80s, when his British animated children’s TV series Thomas & Friends was first shown in the U.S. on the PBS series Shining Time Station. Thomas still looks like a British train engine, but he now speaks with a distinctly American accent. And he does indeed speak — thanks to the lifelike animatronic face and mouth he was fitted with just last year. 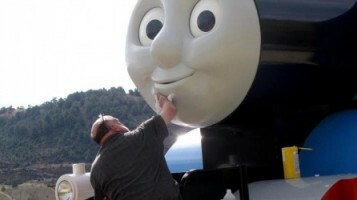 Like countless children who adore him, Thomas needs to have his face washed from time to time. We watched him talking to a mesmerized group of small children and moving his eyes from side to side, as they squealed with utter delight. Thomas’s visit to the Comstock saw every ticket on every one of the seven daily trips down to Gold Hill and back sold out, and the three passenger cars coupled to the celebrated tank engine were packed full of joyful kids — and adults. Watch the Video “Virginia & Truckee Hosts Thomas” (Oct. 25, 2015). Coming up on the V&T Railroad in November and December, the Candy Cane Express offers a unique old-fashioned Christmas Season experience for young and old alike. In cozy heated coaches, passengers will be treated to spiced hot cider, cocoa, delicious Christmas cookies, and, of course, candy canes. Sing-along Christmas carols and a reading of Clement Clarke Moore’s immortal poem ‘Twas the Night Before Christmas will further enhance the warm, friendly atmosphere and holiday mirth making. Along the scenic route between the historic mining towns of Virginia City and Gold Hill, the train passes twice through the enchanting Candy Cane Tunnel, a sight that never fails to delight the children. And watch for wild horses along the way, too. Trips last over 50 minutes, with two trains per day departing the 1870 V&T Depot and museum at 166 F Street at 12 Noon & 2 PM, on three consecutive weekends — November 27, 28, 29 & December 5, 6, 12, 13. For tickets and more information visit the V&T Railroad’s Candy Cane Express webpage.